Buddhism and psychedelic exploration share a common concern: the liberation of the mind. 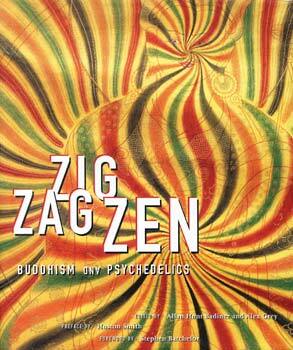 Zig Zag Zen: Buddhism and Psychedelics is a landmark anthology that launches the first serious inquiry into the moral, ethical, docrinal, and transcendental considerations of the intersection of Buddhism and psychedelics. Through numerous essays and interviews by such luminaries as Joan Halifax Roshi, Peter Matthiessen, Jack Kornfield, as well as visionary art by Odilon Redon, Mark Rothko, Alex Grey, and more, Zig Zag Zen is a provocative and thoughtful exploration of inner states and personal transformation. "Zig Zag Zen is a treasure trove--inspiring, frightening, powerful, funny, eye-opening, and a source of great wisdom on a subject that our society finds endlessly confusing." "Zig Zag Zen shines by its fairness: its authors squarely face the Zig as well as the Zag. That's Zen at its best." "Zig Zag Zen is a must read for anyone who is concerned about the future of Buddhist practice." "Zig Zag Zen touches all the high points . . . it is an important book." "The first work of its kind, Zig Zag Zen challenges Western Buddhists to acknowledge their closeted psychedelic legacies, while confronting users with the troubling duality undermining any chemically dependent spiritual path." -- Douglas Rushkoff, author of Ecstasy Club, Playing the Future, and Coercion.